An art project by Korean artists is on exhibit at the TINA B. Contemporary Art Festival in Prague, giving fresh perspectives on Korean art to the global audience. The project titled “Woo:ri,” the Korean word for “us” or “we,” showcases installations and media art at various places throughout the historic city of Prague during the art festival, which ends on Wednesday. The Korean art project is put together by both young and established Korean artists and curators, including JW Stella, who regularly stages curatorial works at international art events. As the project aims to explore the “interrelationship between you, myself and us,” it sheds light on Korean society, the strong sense of belonging of society’s members and the changing trends in a multi-cultural society today. The artworks were opened to the public last week along with performances by local artists and masses by Catholic priests. Some of the artworks are installed at cathedrals including St. Salvator, St. Giles Dominican Priory and Brevnov Monastery and are on view until December. “Artworks have never been displayed at Catholic churches in Prague, so viewers and tourists all found it interesting to see contemporary art exhibited in the old churches,” said Ku Yena, PR coordinator of JW Stella Arts Collectives, a non-profit art organization which plans international art projects based in Seoul and London, led by the curator JW Stella. 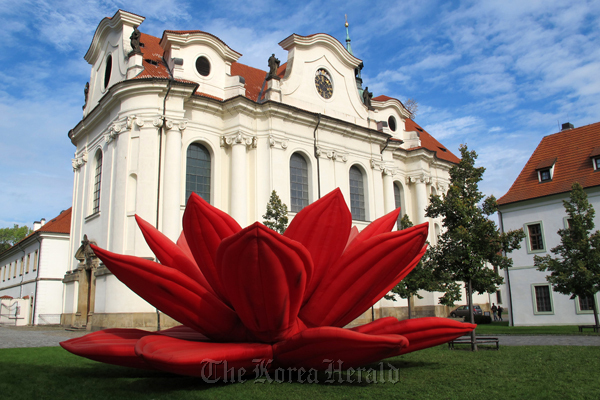 The artworks include Choi Jeong-hwa’s gigantic balloon chandelier installed above the altar of St. Salvator, Hong Soun's collages of faces posted on the Baroque windows at St. Giles and Kim Byoung-ho’s sound installation at the heart of the sanctuary in the Carmelite Monastery in Slany. “The special collaboration has introduced a new definition and dimension of the role played by contemporary art in our era,” said Norbert Schmidt, director of the Center for Theology and Arts in Prague, who co-curated and organized the special project at the Catholic churches. The TINA B. Festival ends on Oct. 31 and the special art project at the Catholic churches continues through Dec. 31.